Montclair Township municipal offices are located at 205 Claremont Avenue, Montclair, NJ 07042; phone: 973-744-1400. Photo: House at 147 Park Street, ca. 1894, Montclair, NJ. Part of the National Register of Historic Places Multiple Resource Area (MRA, 1988) for Montclair, NJ Photographed by user:Snowilli (own work), 2012, [cc-by-3.0 (creativecommons.org/licenses/by/3.0)], via Wikimedia Commons, accessed October, 2012. Montclair and its development coincides with the laying of the railroad tracks in 1872. Prior to and following the Civil War, American communities witnessed the development of railroads throughout the entire nation. Small towns used all their political and financial influence to encourage railroads to build a station in their towns. New Jersey was especially singled out for new tracks due to the State's strategic geographical location and favorable corporate laws. Bloomfield, a growing city, had several tracks between that city and the others but the residents of West Bloomfield (Montclair) wanted a railroad line there. One line was extended there in 1856 but this was notoriously inefficient. Then, after the Civil War, with Bloomfield growing daily, Montclair initiated proposals for a railroad of their own. A corporate charter was issued to two business partners, Julius Pratt and Henry Spaulding, for the purpose of building a track from New York to Montclair. They had hoped that they would not have to invest an enormous amount of money into an independent railroad. They had planned to use the threat of another railway as an inducement to the Morris and Essex Railroad to establish through trains between Montclair and New York. However, there was not enough business to merit this program. In the meantime, another railroad was organized which sought a route across New Jersey to New York. As finally agreed, the Montclair Railway Company would build a line from Jersey City to Greenwich Lake where it would connect with the New York line. The New York line in return would guarantee its bonds and then lease the use of the line from the Montclair Company and operate the two as one. Bloomfield residents were not about to tolerate the enormous debt about to be incurred with the new railway contract and denied permission to build any more railroads in Montclair. The problem was resolved in 1868 when Montclair seceded from Bloomfield. There was no adverse reaction to the people of Montclair from Bloomfield due to the estrangement which had been developing through the years. Once the township of Montclair was formed, Pratt and Spaulding persuaded the necessary three-fourths of the property holders to have the community issue a $200,000 bond in order to assist the railway. However, private investors contributed most of the $4,000,000 needed to build the railway. When the railway was completed, late in 1872, Montclair was in danger of financial ruin when the town budget tripled at the time of the 1873 panic. With the $200,000 bond to be paid over a thirty year period, went through all legal resources to avoid heavy taxes. The United States Supreme Court even became involved in 1883 when Montclair contested the validity of the bonding in the case of Montclair vs. Ramsdell. The Court held that Montclair was held liable for the $200,000 and all accrued interest charges over $350,000. For a time taxes were enormous until Thomas Russell, Stephen W. Corey and George P. Farmer of Montclair assumed responsibility for nearly $200,000 of the total amount owed. Therefore taxes were substantially lowered and the citizens of Montclair slowly paid off its debts as the town rapidly grew. The Delaware, Lackawanna and Western Railway Company opened its Montclair Railroad Station in 1913. The First Residential Historic District, which includes 240 structures built between 1740-1932, lies south of the commercial section on Bloomfield Avenue. Within an irregular boundary the District contains many of the 19th century estates which developed from the farms of the first settlers. Marlboro Park is a turn of the century residential railroad development, located to the east of the railroad within walking distance of the Watchung Railroad Station. The District boundaries conform to the original promotional brochure published in 1900. The Park includes 65 properties built between 1898-1925. Erwin Park, which includes 50 properties built between 1897-1927, is also a turn-of-the century railroad development, though designed to attract more prosperous commuters. 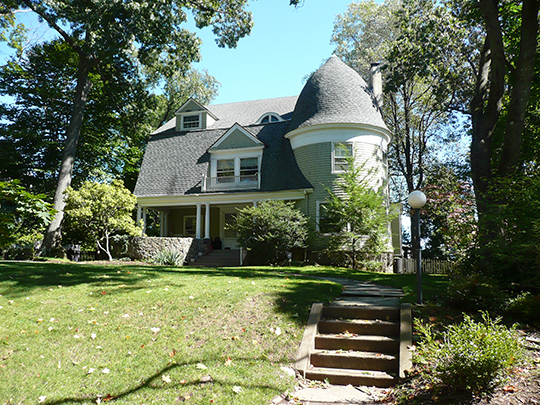 Situated to the west of the Watchung Railroad Station, this unique cluster of commodious homes is also within walking distance of the station. The Mountain District is a distinctive strip of high-style mansions situated on the hillside slope of the First Watchung Mountains. The 174 properties in this District were built between 1870-1934. The Miller Street Historic District is part of a neighborhood which has continuously provided housing for local workers since the 1830s. There are 24 Vernacular cottages built between 1870-1930 in this area, which is situated south of Bloomfield Avenue. The Pine Street Historic District is significant as a intact working class neighborhood with vernacular style frame residences built in the 1880s to multi-story masonry buildings constructed during the first decade of the twentieth century to the late 1930s. New Jersey Department of Environmental Protection, Historic Sites Section, Montclair Railroad Station, Essex County, New Jersey, nomination document, 1972, National Park Service, National Register of Historic Places, Washington, D.C.
Eleanor McArevey Price, Planning co-ordinator, Preservation Montclair, Historic Resources of Montclair Multiple Resource Area, 1986, nomination document, National Park Service, National Register of Historic Places, Washington, D.C.